Why learn the notes on a guitar fretboard you might ask? Sure you can get away with knowing a few songs and even become quite a good guitarists without ever knowing the notes beyond the open string notes. But your development will always be limited to a point. And if you ever want to improvise it will be very difficult. This post will assume that the reader know very little about the notes on the fretboard. This is a starters guide to the fretboard for beginners or for guitarists who have never learned the notes on the fretboard. Yes scales and chords are all in patterns, but you need to be able to find the root note – and usually quickly. Improvising: If you are improvising over other music and they tell you they are in the key of C and you know the scale pattern you should be playing but have no idea where to start that scale you’ll be lost. If you know the notes on the fretboard you’ll be able to find that root note quickly and easily. Performing Leads: If you are performing leads, you will want to make full use of the whole fretboard. This doesn’t mean that you will know the name of each note as you are playing it – you won’t be able to compute it that fast. But if you can find the root note for the scale in different parts of the fretboard it will enable you the potential to create a much more interesting and impressive lead. Composition: Knowing the notes of the fretboard can also be a huge help for writing compositions/songs. Chord construction becomes much easier when you know the notes on the fretboard or can at least quickly figure out what they are. And to create a better composition on the guitar creating more interesting chords in different parts of the fretbard will go a long way to making a more interesting song. These are just some of the reasons why you might want to learn the fretboard but there are other reasons too – and even though it sounds like a daunting task it will actually make playing the guitar more enjoyable in the long run. O.k. so here are some basics you’ll need to know to learn the fretboard on your guitar. The musical notes are named by letter from A to G – so A B C D E F G. And there are also 5 extra notes known as sharps or flats. There are a total of 12 notes – the 7 above plus 5 sharps/flats. Those sharps/flats are named – A#, C#, D#, F#, G#. A# is a half tone above A. B is a full tone above A. So A, A#, B, C – hang on, where’s B#? B doesn’t have a sharp and E doesn’t have a sharp either. The gap between B & C is a half tone (a.k.a. semi tone) and the gap between E & F is a semi tone. Still with me? Good. But what about the flats? The flats are Bb, Db, Eb, Gb, Ab – these are actually the same notes as the sharps but with different names. I won’t get into why here – that’s for another post! So Bb, which is a semi tone below B and a semi tone above A, is the same note as A#. Db is a semi tone below D and a semi tone above C – so the same as C# – etc. So the flats/sharps are A#/Bb, C#/Db, D#/Eb, F#/Gb, G#/Ab. So we have these musical notes but where do they go on the guitar. As you probably know, in the standard tuning of a guitar the open strings are E, A, D, G, B, E. Play those strings on the 12th fret and you have the same notes – but an octave higher. On each string – from the open string to the 11th fret – you have all 12 musical notes. So on the E string each fret represents a semi-tone so it’s really pretty easy when you think about it. For example on the 6th string (Low E) your notes as you go up the fretboard are E (open), F (1st Fret), F#/Gb (2nd Fret) G (3rd fret) and so on. This means that in between the open string and the 12th fret there is only 1 of each note on each string. Doesn’t seem so daunting now! 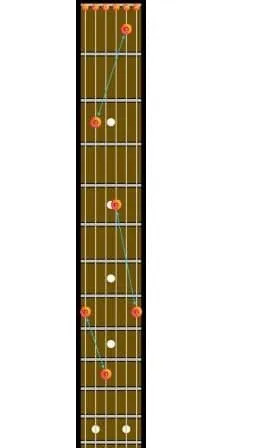 And to make it even easier to find the notes, most guitars have dots (or other patterns) on the 3rd, 5th, 7th, 9th, 12th, 15th and 17th frets to help you know where you are. So let’s use E as an example and locate every E between the open string and the 12th fret on each string. Remember there will be 1 of every note on each string. That’s every E between the open string and 12th fret – easy right! Now let’s take a look at A. If you look closely there are some patterns emerging here. Where the note is on the 6th string the same note is two frets up on the 4th string. E.g. for the E – it’s open on the 6th string and then 2 frets up on the 4th string (2nd Fret) and for the A it’s 5th fret on the 6th string and then 7th fret on the 4th string. The same applies for the 5th string. The note on the 5th string is the same as the note on the 3rd string two frets up. E.g. E is on the 7th fret on the 5th string and 9th fret on the 3rd string. If the note is on the 4th or 3rd strings then the note same note two strings down will be 3 frets up. E.g. there is A on the 7th fret 4th string and the A on the 2nd string is on the 10th fret (3 frets up). Practice playing around with this on your guitar and it will make sense. If the note we are looking at is open on any of the strings it will be the 7th on the next string. The exception to this rule is that the open 3rd string (G string) corresponds to the 8th fret on the 2nd string (B string). Whatever the note is on the 6th string will be on the same fret on the 1st string. This is because, in standard tuning anyway, both strings are tuned to the same note. Check out the video at this link to for more on learning the fretboard. Check out the image to see how this works with the note C.
There are certainly other patterns but these are a good place to start. Play around with these on your guitar. Start with learning E, A, D, G, B, F and C – these will be easier to learn than the sharps/flats. I find it’s easier to learn patterns like this to start your journey into learning the fretboard rather than trying to memorize which note goes in which fret. Play around with this enough and it should start to sink in. Thanks for reading and I hope this will help you in learning the fretboard on your guitar. If you have any questions or comments please feel free to leave them in the comments section below. You’re very welcome. It makes it much easier to learn the notes on the fretboard when you understand how the patterns work.